Cape May National Golf Club features a fully stocked pro shop, specializing in Callaway, Srixon, and Titlest. 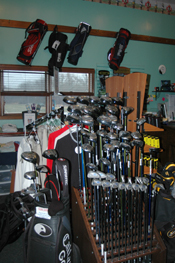 Services include club repair and fitting. We also carry caps, golf balls and accessories, and glassware featuring the Cape May National Golf Club logo. © 2017 Cape May National Golf Club. All rights reserved. | Site design: Cape Publishing, Inc.